I like it – may I humbly suggest 2 more skills that can be added to make interesting choices? 1. Medicine (or Surgery)[Sorcery]allows more clerical style magicians with non-magic healing ability – or dangerously unhinged medical students for that matter. 2.Animal Handling[Stealth/Steel?] Allows the use of larger more dangerous warbeasts or packs of them. Great for Ranger types. Both are desirable but a bit different. Allow slightly odder archetypes. You know, I did have a beast-master prototype that used the thrall-binding trait from sorcery, but to be honest the GP cost aspect of thrall-binding (which will be clear when I post the path of sorcery traits) doesn’t really fit the animal companion thing. It should probably be a separate trait as you suggest here, and could also be used for characters that want to make calling a mount a thing (like the First Edition paladin). Maybe chirurgy for the medical trait? I don’t have a good mechanic for it though, and I’m hesitant to introduce a cure light wounds alike. Ideas? Perhaps something like liquid courage that can be used directly after combat. I don’t know. Healing abilities are super tricky to get right. Oh oh maybe chirurgy is a flesh-shaping tradition that also involves a mutation table and cross-breeding. I would have Chirurgy be straight up medicine – at least I have it as such on my Apollyon table for Specialists & Clerics. It allows A) Better HP recovery on Recovery rolls (1D6 vs. 1D4) B) Surgery allowing additional save vs. death or save to stop penalties from going negative HP – maybe just to stabilize a person in negative HP rather than having them bleed out. C) Slow Posion/Cure Poison (additional save) [higher skills levels] D) Cure Disease [higher skills levels]. Disappointed at the lack of weighting with attributes. I understand the desire to follow the OD&D model, but really like the symmetry of the BECMI -3 to +3 scale. I too am actually fond of the +3/-3 scale, but in this case I feel like the weight is too much. Expected value of 1d6 is 3.5, so for things like damage rolls, the bonus would totally overwhelm the randomness (the die variance in B/X and BECMI can support a much higher bonus, I think, varying as it does from 1d4 to 1d10 and even occasionally 1d12). Further, the focus on development through play as opposed to formed from the beginning makes me think ability scores should have less emphasis. At least that is the reasoning; it is always possible it will work out different in practice. 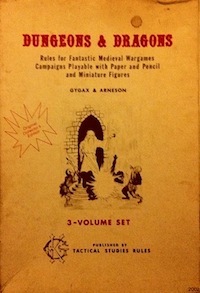 There is still a symmetry, from -1 to +1 (below 9 and above 12), so the particular bonuses are not quite as arbitrary as they are in OD&D (which have different thresholds for bonuses from different ability scores, and do nothing at all with the original three prime requisites (strength, intelligence, wisdom) other than as earned experience modifiers (and extra languages for intelligence, I suppose). What do you think about the trait name beast-friend? Got any better ideas? (1) Animal Handler – Handler is able to handle 2 + LVL of regular (1-2 HD) war beasts and/or a string of up to 5 + LVL of pack beasts. (2) Evaluate Animals– Handler knows how to evaluate and train warbeasts and any normal beast purchased will have maximum HP for its type. Beasts with greater than 2HD will gain a +1 HP per HD. (3) Large Animal Handler – Pack Handler may now handle beast of greater size and ferocity, including any domesticated warbeast up to Handler’s own HD. (4) Trainer – The Pack Handler may train his beast to get the best from their breed. All beasts in his possession gain +1 hit and +1 Damage. (5) Beast Handler – Pack Handler has the skill and empathy to train and handle strange and unusual beast that have been subdued – Beasts must have less HD than handler and handler must take 1 week per HD of the beast and pass a Wisdom check in order to successfully tame a beast, even after it is subdued. (6) Animal Companion – The Pack Handler has become more comfortable around animals than around other sentients and has developed a special relationship with one special creature. This creature will have the same HD as the handler and attacks for +2 damage, it is remarkably intelligent and can communicate with the Handler almost as well as if the two could speak. It might be good to explain traits sooner, since you mention them so much. I think it would make this clearer. It sounds like a cool system thus far. Probably a good idea. I’ll try to focus the next post on some traits and how they work. No Path of Faith? Or is that assumed to be covered by Sorcery? And, if so, do you intend all that implies? Yes, there is no separate path of faith. However, sorcery does not preclude submission to a higher power. The source of a wonder-worker’s power could certainly be God, and the way I see a cleric being modeled in Hexagram is a prototype that uses traits from both the path of steel and the path of sorcery (an inquisitor or witch hunter might even take some traits from the path of guile). 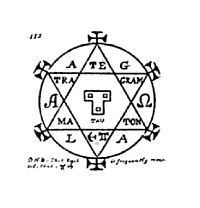 Many of the supposed sorcerers in real world occult traditions include men and women of God. See, for example, the Sixth and Seventh Books of Moses, and Solomon. Of course, one could take a more Lovecraftian, polytheistic, or Shinto (small gods, spirits, and kami) approach to a campaign world’s theology as well, and I think this approach would also work. It does make sense in and of itself in a self-consistent way. But the fact that enlightenment/faith/spirituality/whatever doesn’t give access to any abilities that are any different from those accessible without it implies things about the nature of the game-world. And I was wondering if you consciously intend those implications. If you do intend those implications, then what you have seems good as is to me. But, if you don’t want to imply that enlightenment/faith/spirituality/whatever doesn’t give access to any unique abilities, then you might want to change or add to what you have. Who says that elements of the path of sorcery don’t require enlightenment, faith, or spirituality? Consider daoists or yin yang masters, for example. It could also be called the path of wonder. In the end, the details will of course be up to individual referees, and I don’t plan on explicitly dictating the metaphysics with the implied setting, though I am certainly suggesting several different possibilities through various rules, and yes it is intentional! Also: path shouldn’t be read as power source. Path is more about how you solve problems, and several of the traits are abstract enough that several different underlying mechanisms could be at work. For example, thralls could be walking dead or nature spirits (among many other possibilities). I like the term “Path of Wonder”! Not only does the word “wonder” convey the idea of everything mystical better than the word “sorcery” does, but it also seems to me to go even better with the words “guile” & “steel”, too. If you do provide suggestions for how to make some or all mystical abilities dependent on enlightenment, faith, spirituality or some such, then that would make the system more useful for referees who don’t want to run game-worlds in which divine power is at least apparently no different from arcane power. You know, I did kind of dislike how two path names started with “s” (steel and sorcery). And I discovered after I had been working on this game for a while that Paolo’s game has something called the “way of steel” in it. So maybe battle works better. I’ll let it marinate for a while and see if it grows on me. I’ll keep the split regarding divine and arcane power in mind (the diegetic development stuff should work into that nicely, I think; consider, for example, if it’s only possible to take the banishment trait with a churchman prototype or by lessons from a priest in-game). In the case of “steel”, I thought you might be intentionally referring to “The Riddle of Steel” in the old Conan movie. I actually expected that you’d like “bloodshed” better than “battle”. But, if you prefer “battle” over “bloodshed”, then would you prefer “violence” over either of them?